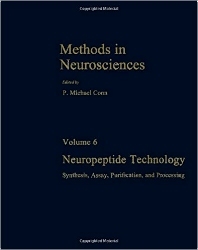 Methods in Neurosciences, Volume 6: Neuropeptide Technology: Synthesis, Assay, Purification, and Processing describes procedures and tools of assay useful for the identification, purification, and quantification of neuropeptides and their receptors. This volume is divided into four sections— chemical synthesis and biosynthesis; measurement of neuropeptides; purification and characterization; and neuropeptide degrading and processing enzymes. In these sections, this book specifically discusses the synthesis of peptide substrates for protein kinase C; synthesis of glycosyl neuropeptides; and ultrastructural localization of peptides. The measurement of neurokinin B by radioimmunoassay; purification and characterization of neuroendocrine peptides from rat brain; and preparation of glia maturation factor ß are also elaborated. This text likewise covers the assays for arginine/lysine carboxypeptidases and enzymes that metabolize atrial natriuretic peptide. This publication is beneficial to neuroscientists and students researching on the synthesis, assay, purification, and processing of neuropeptides.